Moving on to part 2 of our Nike Designers feature, we had the privilege of sitting down with Nike Innovation Kitchen Studio Director and designer Ben Shaffer, the man behind the now infamous FlyKnit. Very much in the same way as Jarrett Reynolds, Ben had an air of mystery to him. Shrouded in modesty, it was hard to work out exactly how influential he is and what projects he’s had his hands in at Nike. His influence became more and more clear as the interview unfolded and he began to modestly mention his involvement in certain projects, one such project being FlyKnit. One thing is for sure; Ben is the studio director of the mythical Nike Innovation Kitchen. The land of magic and wonder at the heart of Nike in Portland. The home to Tinker et al. The birthplace of many of Nike’s most infamous pieces of footwear. To Nike fans, the Innovation Kitchen is the equivalent to Never Never Land. A place of magical and childlike wonder where anything is possible. Keeping with this metaphor, that would make Ben Shaffer Peter Pan, as he is the leader of the gang. It would appear that every designer who truly wants to innovate needs a bit of Peter Pan inside them. They need that part of them that doesn’t play by rules, doesn’t believe in restriction and believes that anything is possible if you put your mind to it. This is definitely the case with Ben. There is something to be said about both Jarrett and Ben and how they hold themselves with such incredible modesty. Both were very chilled and easy to get on with, had next to no ego at all and would most likely get embarrassed if you praised them more than once. Perhaps it’s this lack of need to be in the spotlight, to be noticed that has allowed them to focus and get to where they are? Or perhaps it’s where they are that removes the need for any attention of self-gratification as they get plenty indirectly through their work? Either way, it’s incredibly refreshing and encouraging. As we slipped further into another relaxed conversation that could have run on for a lifetime, Ben let us in on his thinking in regards to what FlyKnit is to him, how long it has been in the making and wether he would be happy with it becoming a lifestyle product. It’s always interesting to talk to a designer about where they find influence and what they feel is important, and Ben’s answers are truly fascinating and incredibly honest. Enjoy the interview and make sure that you check out our piece with Jarrett Reynolds from last week. We hope that this two part feature will inspire any young designers out there, very much like the FlyKnit Collective were able to be inspired by these guys directly. Tell us about your involvement with the Nike FlyKnit Collective in London. I’m here just to talk a little bit about the origin of FlyKnit, since I’ve been involved in it from the start as the creative lead and the designer for the first initial handful of shoes. I’ve just been chatting over the process and hoping to set up the stage a little bit better for those who are taking inspiration from the technology and then moving it into their own worlds. How would you describe FlyKnit yourself? For the footwear process, it’s a brand new way of looking at making shoes. In a fabric, by using different types of yarns and engineering different types of fabric, we’re able to have everything from structure, breathability and elasticity all built into one layer. It’s a one layer upper that’s taking some of the technologies and remastering knit for performance. So knit as in apparel knit, sock knit and utilising those technologies to actually create footwear. 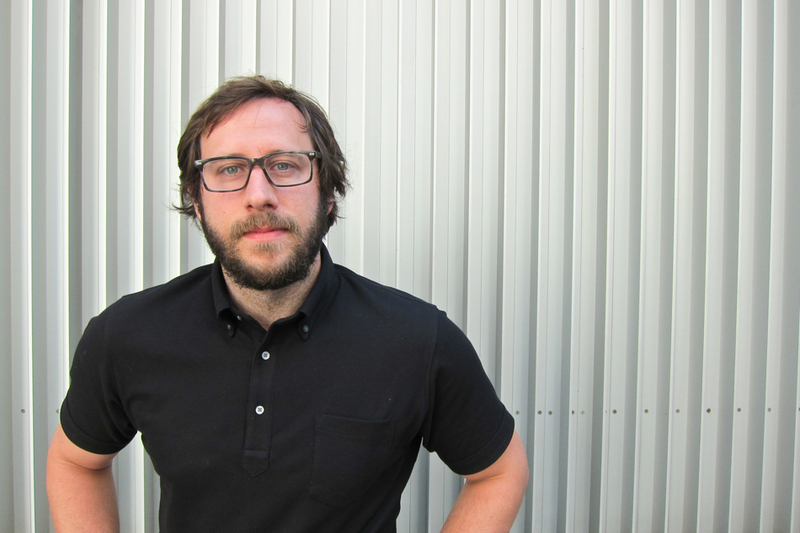 When we spoke to Jarrett Reynolds he spoke about the influence of apparel in FlyKnit. Was that a conscious thing? Were you looking at apparel and trying to incorporate it into it or did it come about naturally? It came about more in looking at trying to address fit within footwear. So in apparel and sock worlds, having structural areas and durable areas where apparel or socks don’t necessarily hold up to the standard that we feel is necessary for footwear, so that was sort of the big leap. I think with anything, the more that we are able to be influenced by places a little bit outside of where we’re at, that repurposing ends up taking us to new ground. Did FlyKnit come about because you thought there was a gap and improvements that needed to be made, or was it a natural evolution? I think there’s always a need for shoes to fit better to your foot. To seem more symbiotic. To seem more like a second skin, a one-to-one fit. So for us it was more about looking at ways to get closer towards shoes disappearing if that makes sense, and only really providing the elements that you need in the sole to allow for the traction or structure that you need there, while trying to make the upper disappear. So it was more problem shooting around that and then looking at ways and other technologies that might help feed that. So how long does a process like that take? It varies a lot, project to project. This particular one we’ve been thinking about for decades and then digging a bit deeper into the technology for probably the last decade, just kinda playing. Then about five years ago we really intensely said “You know what? We really think that we should invest pretty significantly here” and that’s when we started getting a handful of different machines and programmers and taking apart machines and reconfiguring things a bit. How do you feel about your latest innovation in technology being based on one of the oldest clothing manufacture technologies? I think that’s what’s really unique, when you can take a step back and look at something and look at it through different eyes. It’s always very intriguing that something as basic as knitting, it’s looping things together, but by how we’re ultimately able to get that to be automated so we can have consistency is a really unique way to look at things. And there’s something very familiar about it as well, which is nice. As we get more digital and high-tech out of things, the more that we can make sure that there’s familiarity in it, I think the more that it becomes more closely connected for us. So far, FlyKnit technology has been limited to a specific handful of footwear models. Will we see this grow and develop in the future? Because of the fact that now we can take a fabric and adjust and tweak things to have breathability, structure, cabling throughout it, and the fit and comfort levels have been amazing for us, for other footwear it seems to make a lot of sense to have some of those element built into that. So we’ve kind of uncovered a unique new technology that really as we’ve been playing and we’ve been doing a lot of research around things, it’s certainly going to proliferate a good bit into other sports. I often tell people that it’s kind of like we’ve been painting with two colours right now, let’s say blue and yellow, and just recently we’ve introduced red into the equation, so we’re just kind of finding out that red and yellow make orange. What does red and blue make? And as soon as we start playing with alternative yarns, even just elements of how we make this, it’s certainly gonna turn into something pretty amazing. It’s a new bit in the portfolio. Besides FlyKnit, do you have a personal favourite piece of innovation that you’ve had a hand in? Wow, that’s a good question. I personally really like products that are extremely comfortable. Things that work really well with your foot. So for Free and what Free has stood for, that’s certainly been an inspiring technology, just because of the fact that they’re super comfortable, they transition really well from what’s true to sport and the training side of things and strengthening your foot all the way to just a great sort of casual kick as well. So for me, I love those technologies that span that distance and do very well in both of those arenas. As a designer, how do you feel about these performance shoes and technologies getting adopted into lifestyle collections? I think it’s a really good thing. At Nike, our core is getting high level performance products for our athletes and a lot of times when we re-introduce and remaster that standard for what we have for our athletes, it gets reinterpreted and there’s a unique look on how we view anything that’s aesthetic. So for me, I love that. Any time it’s new ground, new ground often reaps some unique visuals, so I think it’s a great thing. How do you feel about the application of something like the Free sole with an older silhouette like the Huarache? To me, I love mash-ups and for part of my job a few years back I was Sportswear Innovation Lead and worked on getting Hyperfuse to some of the Max products and some of the basic old school silhouettes. I love that there’s mashups of newer technologies on old school shoes and seeing what comes together. As long as the end result ends up truly being a super comfortable shoe and one that’s pretty desirable, to me I think “Hey, all is game”. That’s what we do every day, we mash up things. We mash up new technologies and try to address those for our athlete’s problems. How would you describe what you do on a daily basis? I’m a studio director, but I’m more on the design side. We have a huge clan of minds from biomechanists to developers, engineers, material specialists and ultimately on a daily basis we’re working together sometimes with athletes, sometimes in brain storms on how to look at new technologies, new materials and remaster those. Sometimes it means, for me, sitting down and sketching new ideas or trying to block things out visually. A lot of times it’s just enquiring and asking a lot of questions of people in other industries. It’s very much a teamwork kind of atmosphere, even though my responsibilities lie more on the aesthetic and creative visioning side of things. Where do you find most of your inspirations as a designer? They come from all over the place, from our athletes to close colleagues to just what I observe around me. I pull from all of those. 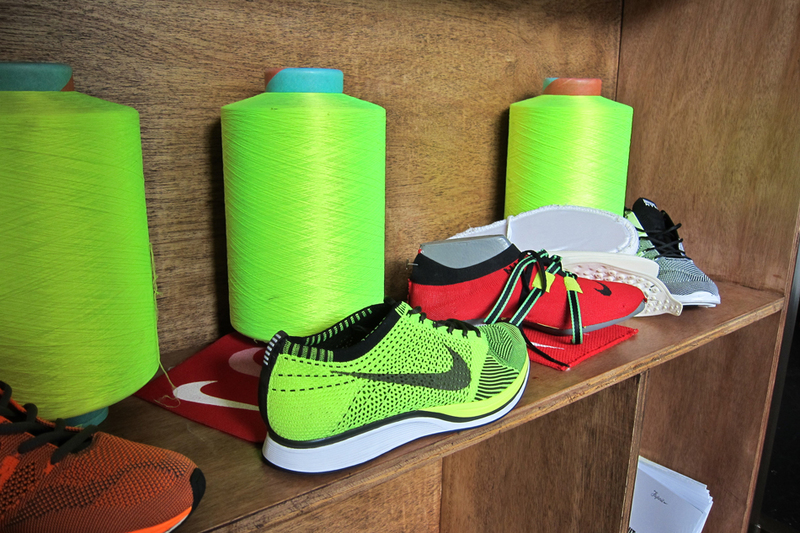 With FlyKnit, that’s looking at a technology that’s around us and repurposing that to footwear. Then of course there’s plenty of challenges on top of that on how to make that a reality. So it really comes from all over the place. Have you found any inspiration in London during your stay? Just observing the energy around the Olympics is really exciting. Some of it now is just observing that side of sport, but then I think it’s really intriguing with how people are taking what we have in FlyKnit and with the collective it’s really intriguing how people take and re-interpret things. Half of what I even do is taking something and reinterpreting and trying to find another avenue for it to flourish. I just love the fact that now I’m getting to see other people taking something that we’ve worked on and making it unique in their own area, so for me, I definitely get inspiration from that. Very special thanks to those at Nike, Exposure and 1948 for making both interviews possible. Huge love to Ben Shaffer for imparting his wisdom on us and sharing his ideas with our readers.